Today I got a parcel from my publishers! 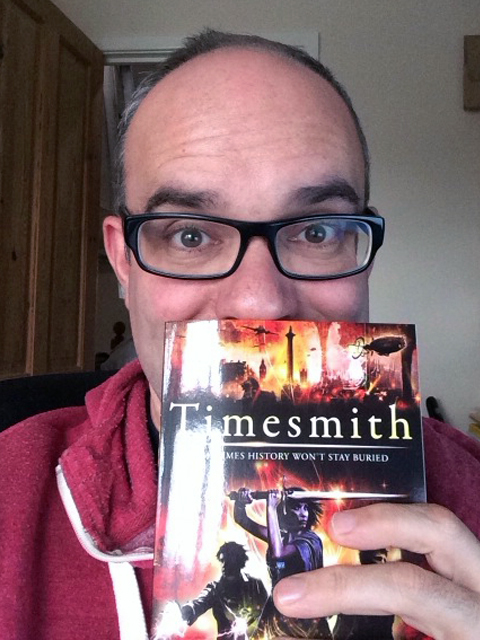 Inside was a proof copy of my second book, Timesmith! It feels great to have a copy to put next to Sorrowline. They look perfect together! It’s due out in March 2014, so not too long to wait now. Right now Timesmith is competing in the Book Cover Wars on Mr Ripley’s Enchanted Books website. Why not show your support and give it a vote? And you can win a haul of books if you leave a comment! And if you want to share the glorious moment of unpacking Timesmith take a look at the video below! You know, when I started doing these blog countdowns at 100 days it felt like I’d never get there. Now its 30 days to go, which is nothing! All I have to do is get the big messy hump of Christmas and New Year out of the way and there it is: January the 3rd, publication day! This is my copy! Go buy your own!! In the last week Sorrowline has been to WAR! War, I tell you! Or at least the cover has. Sorrowline has been competing with three other covers in Mr Ripley’s Book Cover Wars. Its proved to be a fierce battle, with Sorrowline and Alexander Gordon Smith‘s book, Execution: Escape from Furnace, swapping places more than once! And Barry Hutchison‘s book, Afterworlds: The Book of Doom lovely cover has been climbing steadily as well. This race is far from over! More than 200 people have voted for Sorrowline’s cover art, designed by James Fraser! I’m thrilled by so much support for an yet-to-be published book. If you haven’t already you can cast your vote here. There are four great covers to choose from, and a signed copy of Unrest by Michelle Harrison up for grabs! But the big news for me (bigger than a WAR!) was the arrival of my very own copy, hot off the press. 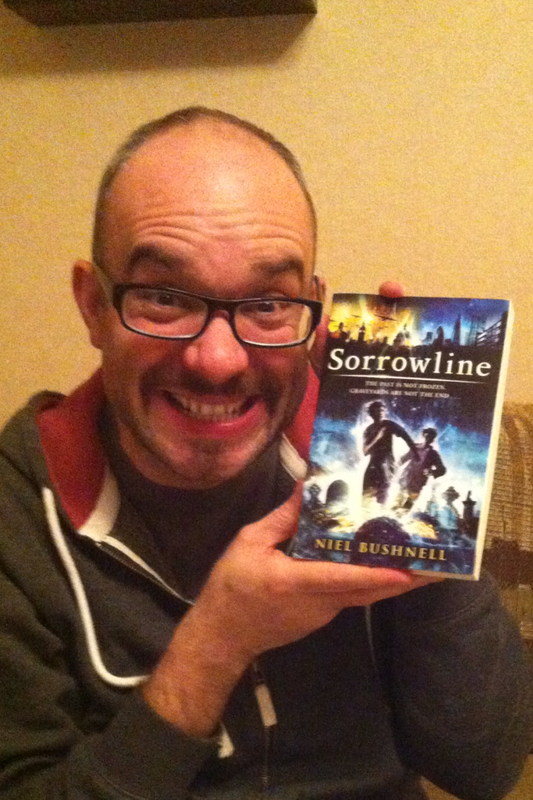 Finally Sorrowline is a real book, with a cover and pages and words! It’s not just a bunch of ideas, or a document on a computer, or even a pile of printed pages with notes scribbled on them. Its a book, just like those ones you see in the shops! But its got my name on the front, and my ideas inside, which makes it the most surreal experience of my life so far! In just a few short weeks there will be more copies out there, sitting on other people’s shelves. Those ideas will be resting in other minds, giving them headaches! Something that was personal and private is about to go public! And its already happening – I’m having strange conversations with friends who have just found out about Sorrowline. “Really? You wrote a book? You?”, “Are you publishing it yourself?”, “Has it got pictures?”, “Can I have a free copy?”, “Are you loaded now?” “What’s the book about?”, “Will I like it?”. So what’s all this Next Big Thing chatter in writer’s circles on Twitter? I wasn’t sure until I was tagged not once but twice! The idea, it turns out, is simple. Its a way to discover new writers, and find out a bit about what they’re up to. In return for being tagged I’ve got to answer a few questions – nothing too personal thank goodness! Oh yeah, and I’ve got to tag five other folk as the Next Big Thing! It’s called Timesmith, and it’s the sequel to Sorrowline, my first book which is due out in January 2013. I’m not entirely sure! I jot down lots of ideas all the time, and this particular one came to me when I was researching my family tree. Sorrowline (and Timesmith) follow 12 year old Jack Morrow as he discovers he can travel through Sorrowlines – channels that connect every gravestone with the date of the person’s death. I think I’d been spending so much time looking at gravestones and death certificates that the idea must have grown from there. Its a fantasy adventure for children aged 10 and upwards. A large part of the book is set is London during World War II, which acts as a very dramatic backdrop for the story. 4) What actor would you choose to play the part of your character in a movie rendition? Tricky! Jack is 12 years old, so I’m not too sure who that would be. The baddy in the book, called Rouland, is easier to conjure up. He’s an immaculately turned out, super-intelligent immortal, who does a nice line in EVIL. Whoever plays him has to not only look the part, but convey someone who feels completely justified in doing the things he does. He’s not a cackling madman, far from it. He knows what he’s doing: he has a plan. 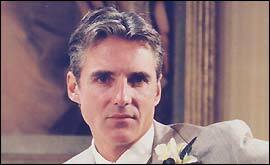 When I was writing Sorrowline I went to see Michael Praed in The Sound of Music. I was watching his performance and thinking of Rouland. 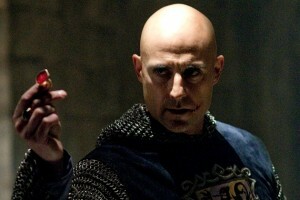 But a closer fit is possibly Mark Strong who combines the air of sinister intelligence with charming good looks perfectly. And that voice! Perfect! 5) What is a one-sentence synopsis of your book? I’m represented by the amazing Juliet Mushens, and the book is being published by Andersen Press. 7) How long did it take you to write a first draft of the manuscript? Sorrowline took me about three months to write the first draft, then three years to edit it into a publishable condition. Timesmith has been slightly different. The first draft took me about a year, on and off, and I’ve just completed the second draft. I think anyone who enjoyed adventure and fantasy will get a kick out of Sorrowline. Everything I’ve ever read! I’m a big fan of comics, and the work of Alan Moore in the 80’s was a major influence. But the biggest inspiration has to be the idea. Once it took hold it was a story I had to tell. 10) What else in the book might pique the reader’s interest? Although there are many time travel stories I think the idea of Sorrowlines is quite new. And once Jack finds his way to London in 1940 he starts to discover an entirely hidden world – a secret society that rules our own. Everything he has learned about the world is challenged, and he discovers the truth about his mother’s death. Its a story set in a much bigger world, somewhere I’m desperate to return to in future books. A quote from Kim Stanley Robinson’s brilliant Red Mars is as good a way as any to begin a new blog. Here we are indeed, but what’s it all about? Why am I starting a blog when the blogosphere as a whole is in something of a decline. We have Twitter, what am I thinking? For the last few years I’ve posted bits and pieces on the Qurios blog, but this new blog is intended to be a bit more particular to me, my passions for animation, art and writing, and a few other random things along the way. I don’t know yet how often I might post, or if any of it will be worth reading, but lets just give it a go and see, shall we?